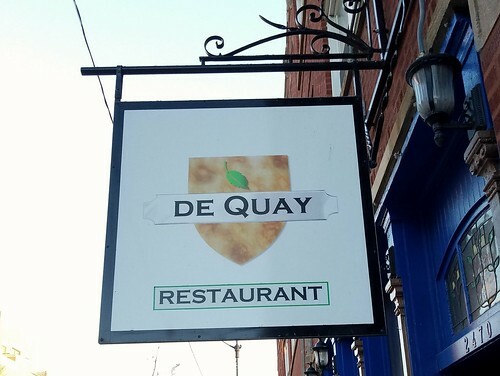 In late 2015, when I was looking for an Indonesian restaurant in the city, my restaurant advisor suggested that I should try de Quay 2470 N. Lincoln Avenue. Having forgotten my camera and not having a cellphone with the snazzy professional setting for the camera, the photos did not come out to my liking and there was no way that I was going to review such incredibly delicious food and associate the food with dark, orange, and blurry photos. Realizing that I still had not written a proper review, I returned recently and was very glad that I did. For my first return visit, it was a brief passing and I sat at the bar. Vibrant and filled to capacity in the general seating area, the bar was a great option. I ordered the curried chicken and paired it with a glass of Pinot Noir. The breast of chicken had been marinated in buttermilk and Indonesian spices, and served with basmati rice that had toasted almonds, dried apricot seroendeng, and pea tendrils. For those who love a bloom to their dishes, the aromatic flavour of the dish will certainly scream winner. And the Pinot Noir was a splendid balance while letting the dish take main stage. 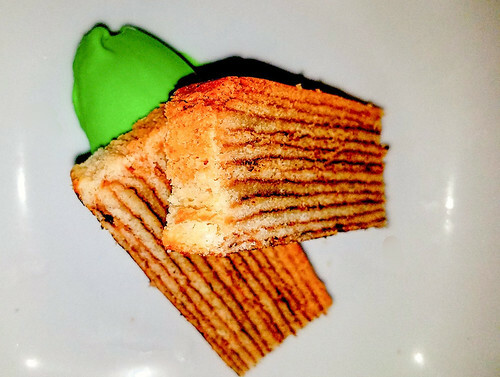 The dessert was an almond spekkoek, a very appetizing Dutch layer cake that came with a dollop of pandan ice cream. Extremely moist and not very sweet, this is a dessert that should be enjoyed slowly and all the better with a cup of coffee. Now, consider the ice cream accordingly when being slow about eating the dessert, but the nutty flavour of the pandan is a nice accompaniment to the spekkoek. It is a wonder that de Quay does not tout this as the most spectacular dessert you will find in Chicago. The second visit involved more food, as my restaurant advisor accompanied me this time. We started with a deerstalker and an FP-45 for cocktails. 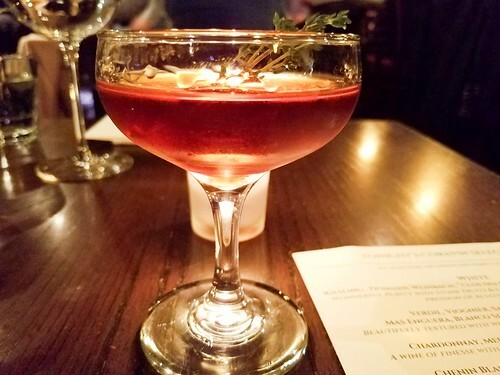 Having recently gone to a gin bar, the deerstalker was a fitting starter of gin, vermouth, orange bitters, maple syrup, and fresh thyme. 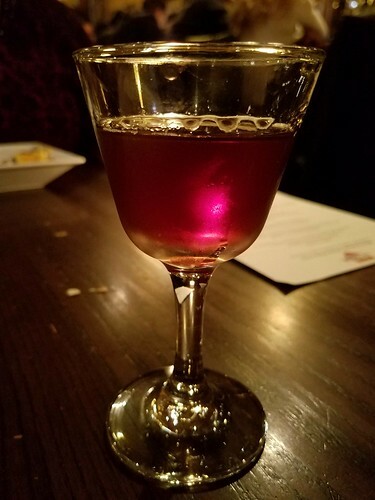 The Old Tom gin, Gran Classico bitters, vermouth, brown sugar, and Angostura bitters in the FP-45 were simply first-rate for an initial libation. Indulging the first landing of pea soup, which was a part of the restaurant week offerings, set the mood for what we realized would be a fantastic evening of dining. 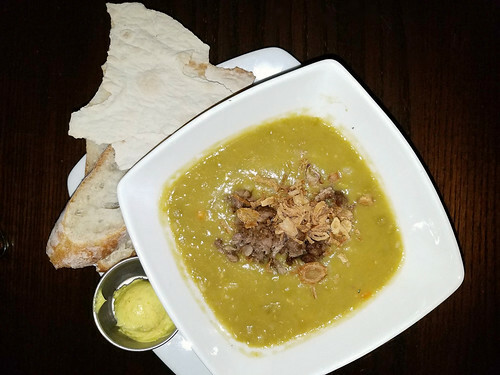 Hearty more like a stew, the bowl of mirepoix, smoked rookworst, turnips, and crispy shallots with the peas made this a winter soup that works well for the nippy Chicago temperatures. The lovash crackers were a nice touch and the soft baguette that came with the dish was fine for sopping up the remaining remnants of the soup, along with the curry butter. The second landing, also a menu item for restaurant week, was a goat Gouda Bavarian. 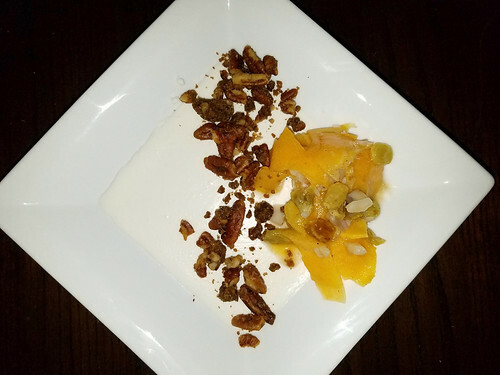 Served with a spiced pecan seroendeng, raisins, butternut squash, and with a chestnut vinaigrette, it was nice that the goat cheese was not so overpowering so it did not usurp the taste of the other ingredients in the dish. 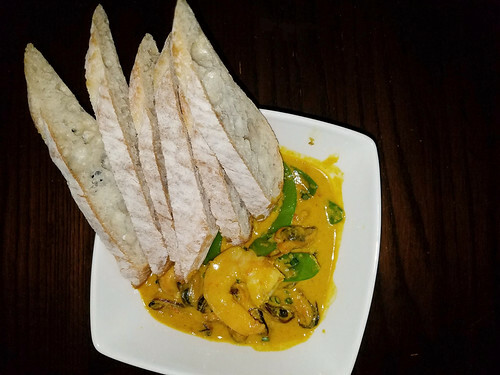 Curious as to the shrimp and mussels menu item and how such a dish could have been prepared to take advantage of an Indonesian influence, we had for our third landing of a bowl of plump shrimp, shelled mussels, roasted hot peppers, and snow peas in a coconut curry sauce with baguette slices for sopping. An absolute winner, the beauty of this dish was not having to fight with plucking the morsels from the shells. 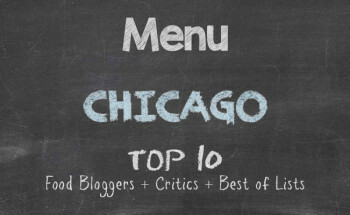 You only had to start delighting yourself on the best mussels dish in Chicago. The fourth landing was a plate of sate glazed, grilled salmon. 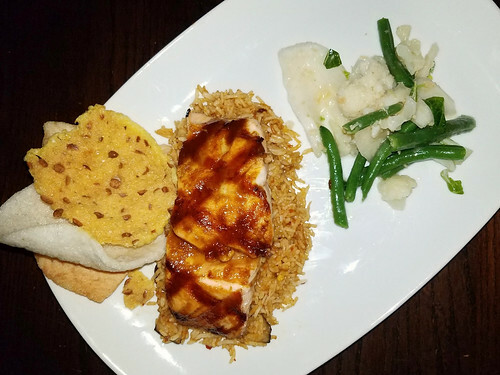 The Indonesia fried rice nasi goreng played well with the salmon and a medley of green beans and cauliflower along with wafers and shrimp crisps made for a dish that is well worth repeat visits for samplings. Not the usual searing done to the salmon, it was flaky and succulent, which made the dish that more delightful. 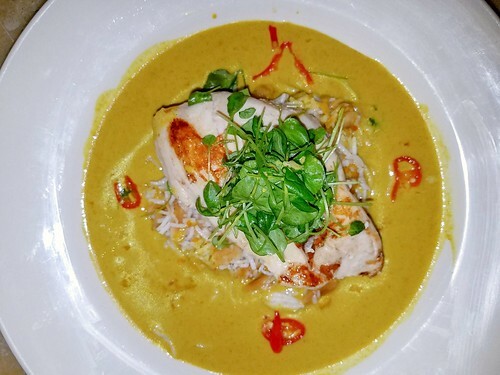 The fifth landing came as baked chicken breast in coconut milk and aromatic spices with pea tendrils over a mango and Thai basil emulsion. An added touch was a coconut Gouda croquette. The chicken had been prepared such that it was easy to cut through it with a fork. And it was quite noticeable that the seasoning had worked its way throughout the chicken during cooking. 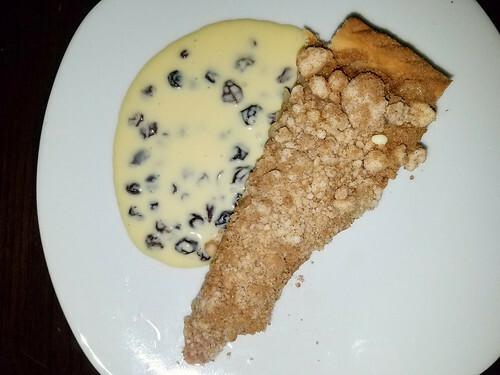 The finale was an apple tart that came with an accompaniment of dried currants in a crème fraîche. I had not been eating sweets for several weeks and felt like I had a bit of heaven with each bite. Very much like the spekkoek during my first visit, this was not as sweet as most tarts are, given the apples were not in a compote, and that probably explains why the apples tasted like they had been just plucked from a tree. The one word I use to describe restaurants that have top service and inviting food is outstanding. That certainly applies to de Quay. The restaurant is not large and seating may be close. 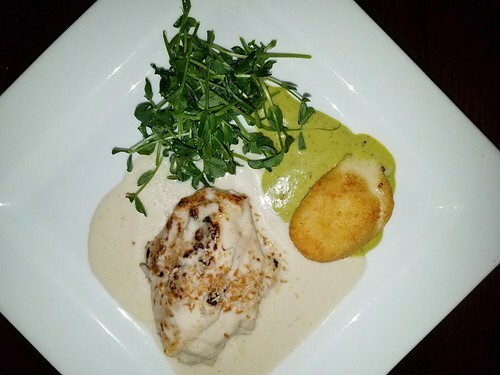 Reservations are highly recommended, as a lot of diners coming through who clearly appreciate the rich savoury dishes. There may be some poetic licensing with the dishes, but that’s okay. If you were to close your eyes, you would undoubtedly agree that the smells and aromas of Indonesia were not compromised. So, here we are at 2016. Thanksgiving and Christmas of 2015 saw warm weather. The very end of the year went from moderate temperatures to icy overnight. That’s Chicago for you. With those temperatures hovering near single digits, that means my appetite requires more satisfaction. My ongoing New Year’s Eve Resolution is to search for more food. Only two days into 2016 and I find myself in some restaurant experiencing food happiness. 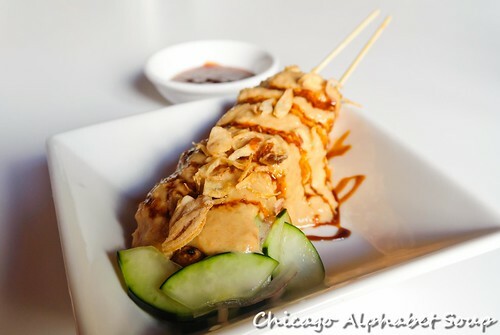 Rickshaw Republic at 2312 N. Lincoln Avenue became my first new restaurant for the Near Year with international flare. Several years ago, I had gone to an Indonesian restaurant in Rogers Park and it has since closed. 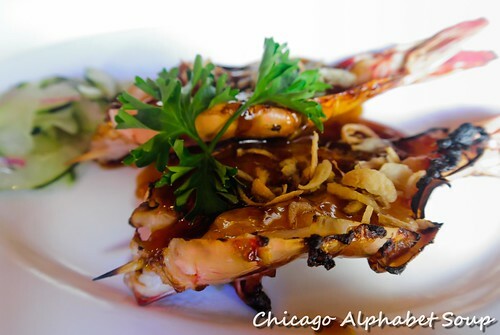 There is another restaurant in Lincoln Park that marries Indonesian and Dutch influence. However, I wanted 100% Indonesian, not fusion, not influence, not faux. For one starter, I had sate ayam. This was chicken satay served on wooden skewers. Dipped in a peanut sauce and topped with crushed peanuts along with a small cucumber salad, I was off to a satisfying start. The sate udang, which was huge shrimp cut butterfly style and served on skewers with a ginger sauce and small cucumber salad, I was almost to my happy place. At the recommendation of the server, I arrived at my happy place thanks to a plate of beef rendang, coconut rice, spicy string beans, potato and corn fritter, boiled egg, and zucchini and carrot salad. The panang and other gravies were addictive. I figured the string beans and fritter would be pedestrian, but they were anything but bland accompaniments. The curry gravy over the green beans was not overpowering, which allowed for tasting garden fresh beans. The corn fritter would make a perfect morning starter. The winners were the tender beef under panang gravy and the lip-smacking coconut rice. I realized that I was not going to have any room for dessert, so I opted for something that would not be heavy on my stomach. The main cook, who I believe owns the restaurant, brought a glass of wedang cincau dan selasih to me. 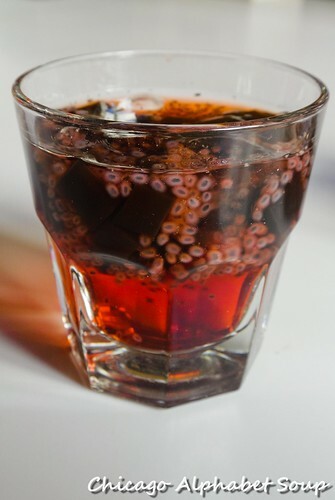 If anyone had told me that grass jelly and basil seeds in ginger syrup was a good option, let alone good for digestion, I would have smirked and ordered something else. Nary a drop of alcohol in it, I could easily become addicted to it as if it was spiked. 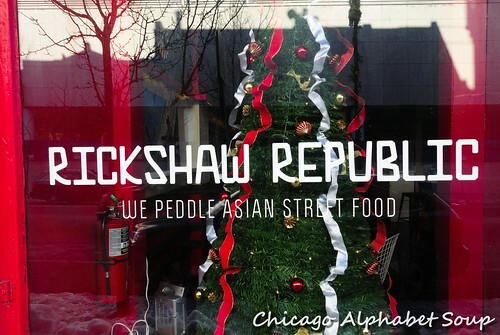 Rickshaw Republic has been in Chicago’s Lincoln Park for over three years. 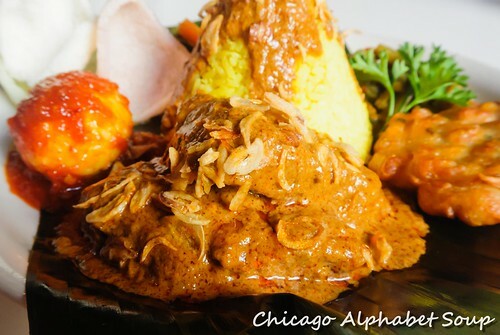 Since Angin Mamari, the Indonesian restaurant I mentioned earlier close, Rickshaw Republic is indeed the only authentic Indonesian restaurant in metropolitan Chicago. The inside is spacious. The service was outstanding, from the recommendations and the owner even coming out to chat briefly. Rickshaw Republic has another fan: me. Oh, my realistic New Years Resolution: wait until leaving the restaurant to squeal with satisfaction if the food is really, really, OMG, really delicious.